Matâ'Utu is the way that Wallisians spell it, and since it is their capital, you'd think they'd know how to spell it. Sometimes its written Matâ'utu also. The French spell it Mata-Utu, but they also spell London as Londres, Edinburgh as Édimbourg and French Guiana as Guyane française. Matâ'utu, Wallis and Futuna - -13.2833 -176. Matâ'utu, Wallis and Futuna + Add a trip = * Not far from: Akaka, Falaleu, Gahi, Haafusia, Haatofo, Liku, Tepa, Vaitupu All about travel to Matâ'utu from other smart travellers on the Social Atlas. Matâ'utu The digital tourist map of Matautu contains the most important roads and beaches of the island. With the adjustable zoom level and satellite view you can see a lot of details. The maps of Matautu are free and are often being updated. You can get the code and insert it on your website. 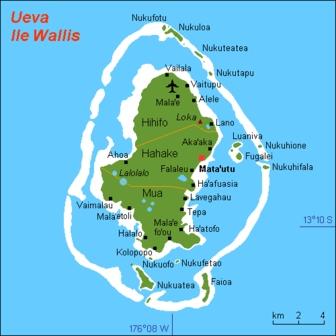 Time for Matâ'utu, Wallis and Futuna, Wallis and Futuna = Current Time: Timezone Region Pacific/Wallis Standard timezone offset UTC/GMT 12.